The slap fight between Google and Amazon, in which the two corporations fought over whether the Amazon Show could display YouTube videos, just started to make a whole lot more sense. Google is pushing a whole range of Show-like devices out through Lenovo, Sony, LG, and JBL. They’ll all have YouTube baked right in. I’ve only been able to interact with the Lenovo version of this new line of products, but I have to admit, the YouTube feature is a nice one! YouTube is already the primary supplier of on-demand music, and it’s loaded with the cooking videos these display digital assistants always seem to show off. While SafeSearch was enabled on the unit I checked out, and will be on by default in all units sold, I’m sure you could still find a way to access some of the more titillating videos available. Yelling at a screen to display videos is more convenient than calling up the videos on your phone (which you’d first have to take out of your pocket!) or searching for them on your computer (which you’d have to type on! Like a plebe!). But YouTube, presumably, isn’t the only reason these smart displays exist. They’re useful for checking on the weather or grabbing reminders from you calendar at a glance, and there are few things as cool as setting up a morning routine on a smart device. You can tell Google “Good Morning” and suddenly the lights are on, the weather is being announced, and then there’s clips of the latest news from CNN. That’s the kind of future Arnold promised us in Total Recall. Lenovo’s smart display comes in two versions, a $250 ( £200) 10-inch version and a $200 ( £160) 8-inch version. That's pretty much in line with Amazon’s 7-inch Echo Show, which retails for £200 currently. But the Lenovo Smart Display has a decidedly funkier look. It’s supremely asymmetrical, with the speaker placed to the left of the display (or at the bottom if you choose to put it in portrait mode). 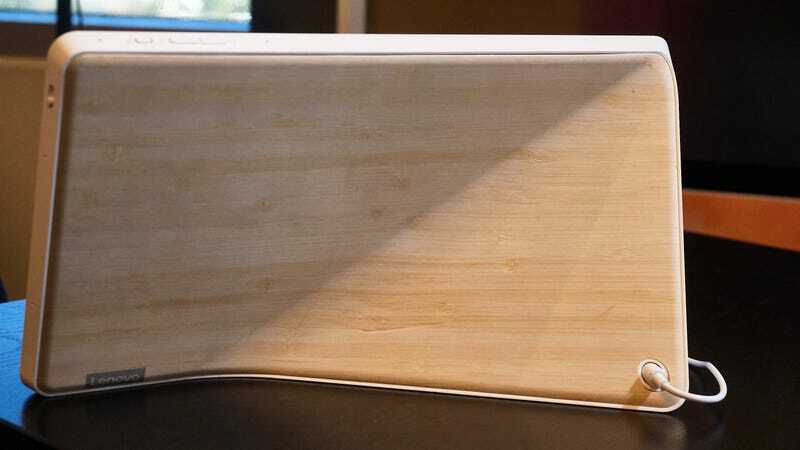 The back, which is lined in real bamboo, swoops out to one side, forming a weird optical illusion that makes it seem as though someone very strong has physically warped the device. There’s a webcam directly above the display that you can use to make video calls to other smart displays or to any smartphone via Google Duo. And there’s a physical mute switch if you want the Smart Display to stop listening to the chatter of everyone in your home. Unfortunately, you won’t be able to customise the device’s super simple home screen. A Google rep told Gizmodo that was because they preferred simplicity in this inaugural generation. The smart displays all operate on Google’s IoT variant of Android, Android Things. 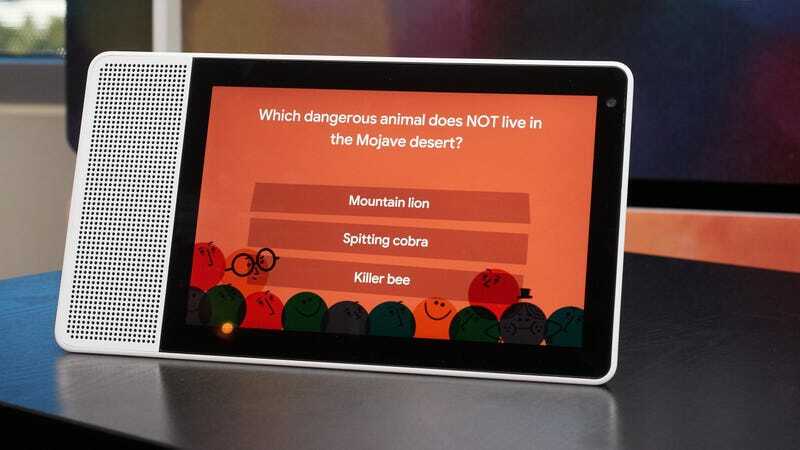 Because the Qualcomm SDA624 processor that powers the Lenovo Smart Display is designed specifically for IoT, there’s no room for a cellular radio. Instead the chip is focused on voice and camera processing. The “performance required is higher than in smartphone,” Seshu Madavapeddy, Vice President of Product Management, Internet of Things, at Qualcomm, told Gizmodo. He specifically pointed to the challenges of capturing quality video in homes, where lights are often a lot dimmer than than a smartphone camera can handle adequately and consistently. 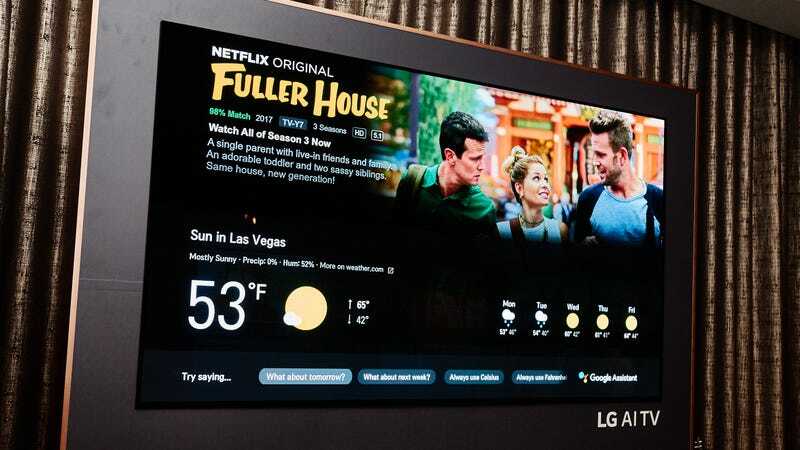 Besides the smart displays coming from Lenovo, Sony, LG, and JBL, Google is also expanding the number of televisions and speakers that feature Google Assistant. LG’s new line of premium OLEDs will have Google Assistant inside, with queries sent through the remote automatically popping up on the TV. Google said other TV brands are also baking Google assistant in. Those brands include TCL and Haier, two Chinese brands noted for their great budget TV sets. As for speakers, Google points to products from Bang &amp; Olufsen, Braven, JBL, and LG, among others. 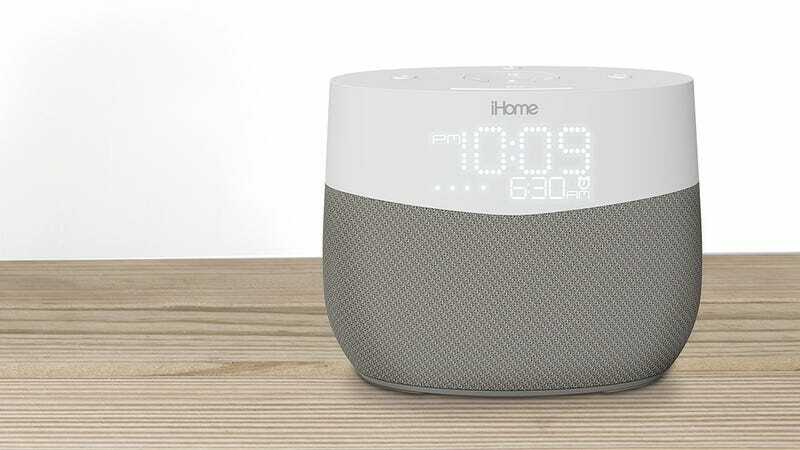 Even iHome, which is known for its iPod-focused alarm clocks, has a Google Assistant alarm clock now. The iGV1 looks like a Google Home in one of those funhouse mirrors, but it has a display that can show the time, alarms, and weather, and there’s a USB port for charging devices. Google has been promising to dive further into the smart home space ever since it announced Android Things back at Google I/O in 2015. Until now, the incursions have felt sporadic. A Google Home here, a Google Assistant in a Sony TV there. Apart from the Google Home speaker blitzkrieg at the Pixel 2 event last year, the news has been a trickle. But now Google’s turned on the faucet. Its a shame for Amazon, the undisputed smart display/speaker king, that it’s been caught in the wake. 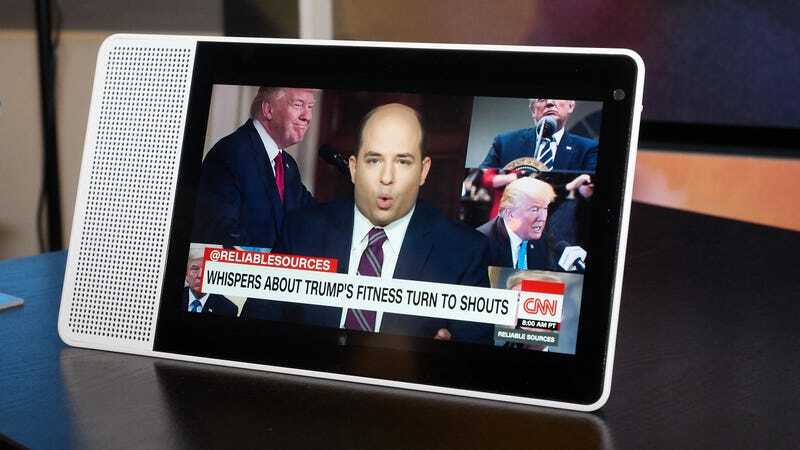 With Google pushing its smart displays this fiercely, I wouldn’t hold your breath for YouTube returning to Amazon devices any time soon.